There are two things I love about charcoal grills: They sear meat to perfection and give food a unique, smoky flavor. But it can be hard to find the perfect grill if your budget is $100. That’s why I’ve taken it upon myself to find the best charcoal grills under $100. All you have to do is go through the list and find one whose features you love. 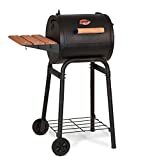 Of all the grills I researched, the 22-inch Weber Original Kettle Charcoal Grill stands out from the rest because of its stylish design and excellent price. It perfectly grills meat and vegetables thanks to its circular shape that creates a convention heating system. Its awesome venting and large space enable it to smoke meat and vegetables easily and efficiently. 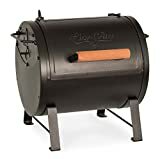 While the Char-Griller Table Top Charcoal Grill may be the most affordable on this list, it must be used on a table top. Its counterpart, the Char-Griller comes with wheels that make it easy to move. But the most portable grill on this list is the Pinty Portable Folding Charcoal Grill as its legs fold quickly for easy transportation and storage. When it comes to cooking space, the Weber Kettle Grill tops them all. It has 363 square inches while all the others have 250 square inches. 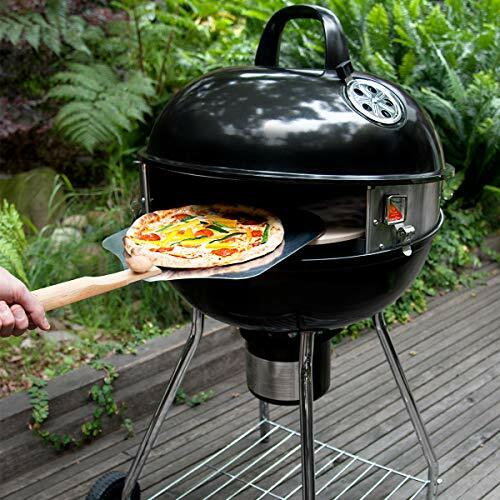 The PizzaQue Grill is perfect for making pizza (pizza lovers rejoice!). While all the charcoal grills listed here hold their own when it comes to grilling, you’ll be hard pressed to find a better charcoal grill for $100 than the Weber Grill Original Kettle Grill. Replicate a traditional wood-burning pizza oven using your charcoal grill. The PizzaQue Deluxe Kettle Grill Pizza Kit for 18-Inch and 22.5-inch Kettle Grills converts your grill into the perfect pizza oven in just minutes. The kit will allow your grill to reach cooking temperatures up to 900F. The cordierite baking stone within the kit absorbs and evenly distributes heat, eliminating hot spots. Your pizzas will cook quickly, evenly, and with that great smoky, authentic flavor. The PizzaQue Deluxe Kettle Grill Pizza Kit gives you the experience of pizza from a traditional wood-burning oven -- but without breaking the bank. Fast and easy to install, and includes a folding aluminum pizza peel to easily transport pizzas to and from your grill. Fits Weber kettle grills (18 inches and 22.5 Inches), Home Depot's Master Forge grills (18 Inches and 22.5 Inches), plus many other similar grill models. ("Weber" and the Weber kettle barbecue grill are trademarks of Weber-Stephen products LLC.) Works with charcoal, wood chunks, or similar fuels. HOW TO USE: Assemble out of the box following the instructions in your manual (20 minutes). Then place on grill, as shown in your manual (5 minutes). Light charcoal (20 minutes); use a charcoal starter for best results. Preheat for about 10 minutes. Use your pizza peel to slide an uncooked pizza onto the stone. Your pizza's cook time is determined by grill temperature and your desired doneness. Use the peel to rotate your pizza halfway through cooking. When it is done, remove using the peel, slice, and serve. PLEASE NOTE: The thermometer in your pizza kit has been calibrated to accurately measure the temperature of grill's cooking environment; the elevated position of the grill lid while the kit is in use may result in varying readouts on the thermometer. CAUTION: Unit will become very hot. Wait for unit to cool before handling. Use heat-safe gloves if handling on the grill. Place on a heat-safe surface if removing from your grill. 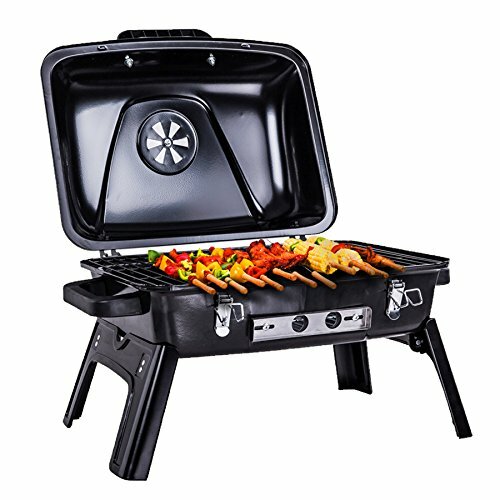 Looking for a portable charcoal BBQ grill? Look no further! Our brand new charcoal BBQ grill can offer a cooking area of 250sq inch, so you can invite 5-7 friends to enjoy your BBQ party at one time! The silicon handle won't cause burnt hands or damage over the grill's coat of painting, so you can have a safe and wonderful party without any worries. Never worry about the mess after BBQ party, for our product has a dust-proof surface and porcelain-enameled & heat-resistant cooking grates. That means it is easy to clean and has no distortion under extreme heat. With so many amazing features, what are you waiting for! Premium quality doesn't have to come with a premium price. Get one now and start enjoying home-cooked meat right away!